Suominen manufactures nonwovens as roll goods for wipes and for hygiene products and medical applications. Suominen is the global market leader in nonwovens for wipes. The company employs nearly 700 people in Europe and in the Americas. The Suominen share (SUY1V) is listed on the Nasdaq Helsinki Stock Exchange. Suominen is the global market leader in nonwovens for wipes. Wiping products made of Suominen’s nonwovens include, for instance, wipes for personal hygiene and baby care, as well as for household and workplace wiping. The company’s hygiene product applications include, for example, sanitary pads, diapers and adult incontinence products. Surgical drapes and swabs are examples of the medical applications. 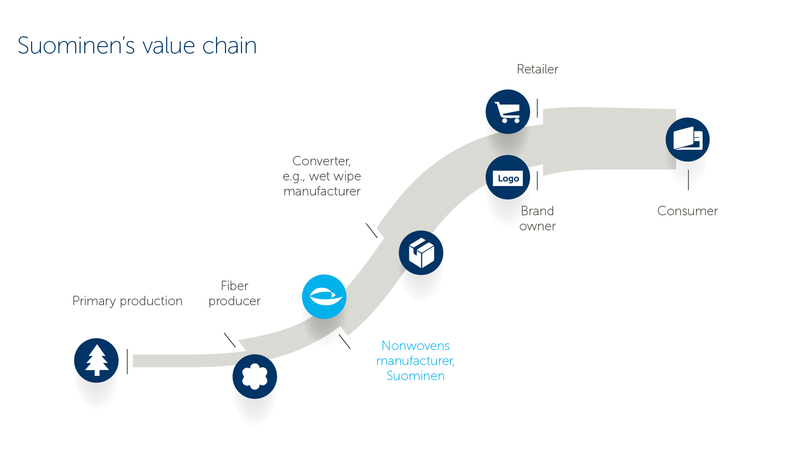 Suominen creates value by taking fiber raw materials and turning them into nonwovens that our customers convert into both consumer and professional end products. Suominen is a nonwovens manufacturer that operates in business markets. Even so, understanding the needs of both consumers and professionals using products made of nonwovens is at the heart of our strategy. The Value Creation Model is basically our business model in a nutshell, which means that only the most essential matters are listed. Still, not all listed matters bear equal importance, nor is their respective relevance presented in the model. That’s why the model should be considered primarily as a whole. Outputs are what comes out of our business activities. 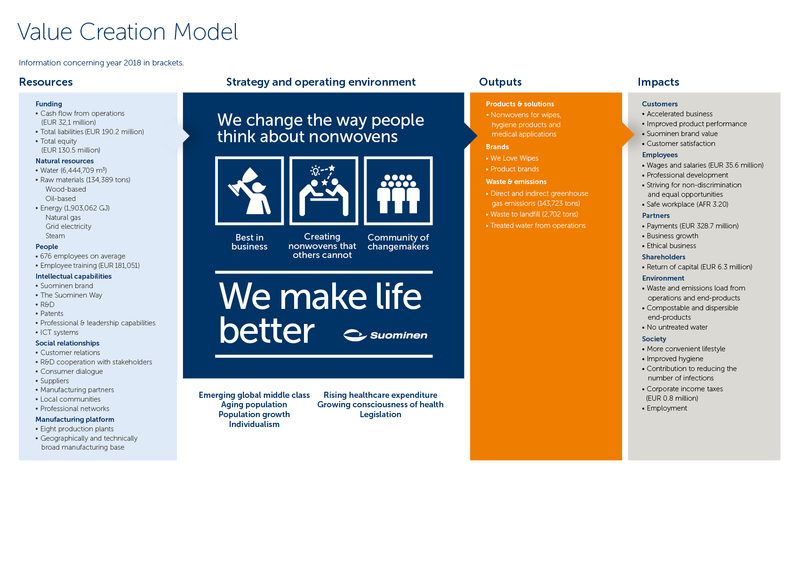 Impacts describe how our business activities and our outputs affect the world around us. In general, nonwoven fabrics are broadly defined as sheet or web structures bonded together by entangling fiber or filaments (and by perforating films) mechanically, thermally, or chemically. They are flat, porous sheets that are made directly from separate fibers or from molten plastic or plastic film. They are not made by weaving or knitting and do not require converting the fibers to yarn. These properties are often combined to create fabrics suited for specific jobs while achieving a good balance between product use-life and cost. They can mimic the appearance, texture and strength of a woven fabric, and can be as bulky as the thickest paddings. During the past few years, Suominen has transformed into a company purely focused on nonwovens. The infographic below highlights the major transformation Suominen has undergone during the recent years. The pie charts describe illustrative net sales breakdown per year while the world maps mirror the extension of the geographical coverage of Suominen's operations. Starting from left, before November 2011 Suominen had three roughly equally-sized business areas, and it operated mostly in Finland and Northern/Central Europe. Net sales were around 170 million euro. In November 2011, Suominen completed the acquisition of Ahlstrom’s Home and Personal business. Overnight, nonwovens became clearly the largest business for Suominen. The company also spread its operations to Southern Europe and North America. The Group net sales grew close to 500 M€, thanks to the acquisition. This acquisition marked the starting point in Suominen's transformation to 100% nonwovens company. 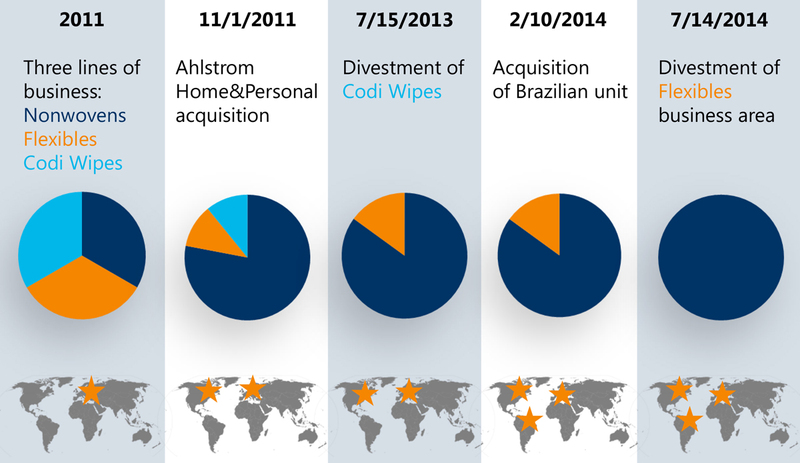 In July 2013, Suominen divested Codi Wipes business area, that was focused on converting nonwovens into wet wipes. The deal clarified Suominen's position in the value chain since after the divestment, Suominen no longer competed with any of its customers. After the deal Suominen had two businesses: Nonwovens and Flexibles. In February 2014 Suominen acquired a plant in Brazil. The deal provided the company the important foothold in the growing South American markets. In July 2014, Flexibles business area was divested. This was the finalization of the transformation – today Suominen is 100% nonwovens company operating in three continents. Seth Dexter II founds C.H.Dexter & Sons in Windsor Locks, CT, USA. The company was later known as Dexter Corporation. The plant has been part of Suominen since 2011. J.W.Suominen Ltd was founded in Nakkila, Finland as a leather treatment factory. Orlandi was founded. The first plant of the company was built in Gallarate, Italy. Amerplast M. Suominen was founded in Tampere, Finland. J.W.Suominen manufactures its first nonwovens product. Tecnofibra/Fiberweb was founded in Italy. Amerplast establishes a plant in Ikaalinen, Finland. Lassila & Tikanoja acquires J.W.Suominen. Amerplast buys a factory located in Nastola, Finland. Amerplast buys a factory in Norrköping, Sweden. Lassila & Tikanoja acquires the full capital stock of Amerplast. Amerplast establishes a sales office in St. Petersburg. Green Bay Nonwovens was founded in Green Bay, WI, USA. Amerplast builds a new plant in Grodzisk Mazowiecki, Poland. Suominen Group is formed when Lassila & Tikanoja gets splitted. J.W.Suominen changes its name to Suominen Nonwovens Ltd.
Amerplast becomes known as Suominen Flexibles. Suominen buys a Dutch wet wipes company Codi International. Suominen Flexibles doubles the capacity of its Polish plant. The production at the Norrköping plant of Suominen Flexibles is terminated. Production at the Nastola plant of Suominen Flexibles is terminated and production is transferred to other plants of Suominen Flexibles. Suominen acquires Ahlstrom Corporation’s Home and Personal wipes fabrics business area. Through the acquisition, Suominen becomes the global market leader within nonwoven roll goods for wipes. 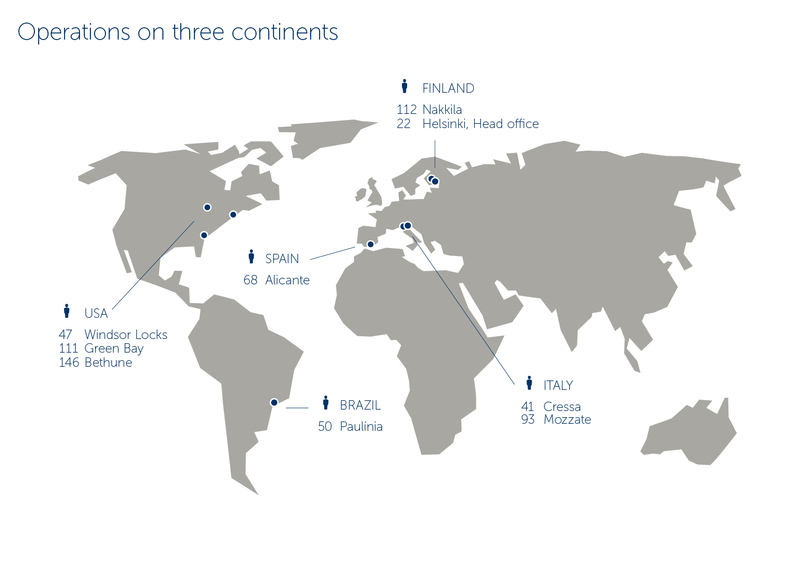 After the acquisition, Suominen operates in eight countries on two continents. Suominen renews its strategy. The new strategy has three corner stones: The Suominen Way (which describes how we work), Step Change in Profitability (which describes how we operate) and In the Lead (which describes how we win). Suominen’s domicile and head office transfer from Tampere to Helsinki. The implementation of the new strategy continues through two development programs, one concentrating on integrating and standardizing supply chain processes and another aiming at accelerating product development process. Suominen divests its wet wipes business unit, Codi Wipes, to Value Enhancement Partners investment company. The deal further strengthens Suominen’s strategic focus on nonwovens and clarifies its corporate structure. Suominen’s largest business unit, Nonwovens, is divided into two new business areas, Convenience and Care, as of 1 January 2014. Convenience business area focuses on serving customers in wiping, travel and catering businesses. 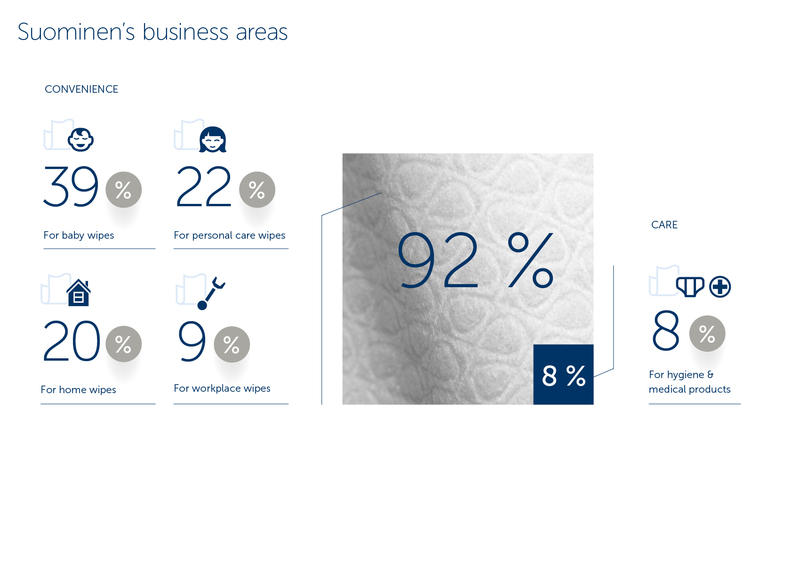 Care business area focuses on customers in medical and hygiene businesses. Both Convenience and Care are reported under Nonwovens segment. Suominen acquired Ahlstrom's Brazilian unit that was formerly part of Ahlstrom’s Home and Personal business area. The acquired plant is located in Paulínia, Brazil. It is the only nonwovens plant utilizing modern spunlace technology in manufacturing wiping products in the country, and the plant is technically capable to supply also industrial nonwovens. Paulínia plant is built in 2008 and employs approximately 40 persons. The deal provided Suominen a foothold in the growing South American markets. Suominen acquired the entire Home and Personal business area of Ahlstrom in November 2011, but the transfer of the Brazilian unit of the acquired business was prolonged due to delay in receiving approval from the authorities and consequent renegotiations. Suominen divested in July 2014 its Flexibles business area (Suominen Joustopakkaukset Oy and its subsidiaries as well as Suominen Polska Sp. z.o.o) to a UK-based private equity firm Lonsdale Capital Partners LLP and the MBI team, consisting of the management of the business.